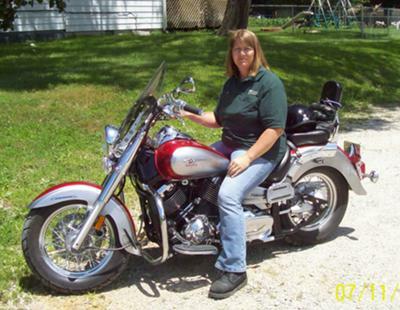 This is a pic of my 2005 V-Star 650 Classic. I've had her for 1 1/2 years now and just rolled over 25,000 miles. She only had 1000 miles when I got it in June of 2008. My husband and I ride all the time and all year long if there is no ice. Wish I had started riding sooner in my life. It's a blast and a boost to our relationship. Nice Bike! I bought my first bike a year ago, a Suzuki S40. I had really considered a V-Star but could not find a 650. As a new rider I was a bit worried about getting a 850 as a first bike so did not get the V-Star, but I sure like them. Yours looks very nice. Enjoy! Thanks for sharing. Very nice looking bike! I get to ride year round too and love this stage of my life. No time to waste!